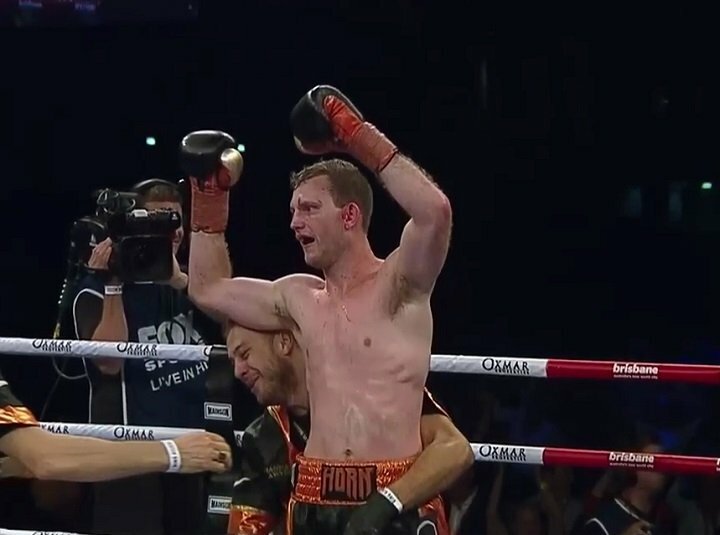 Earlier today in Brisbane, Australia, Jeff Horn made a successful first defence of the WBO welterweight title he won by sensationally upsetting all-time great Manny Pacquiao back in July. Horn, who was well ahead on all three cards at the time, got the TKO win over Cororan of Great Britain in the 11th round. Time was 1:35 and Corcoran, who was pouring blood from a damaged left eye, was saved by his corner who signaled to the referee how he had had enough. Horn is now 18-0-1(12). Corcoran, who has vowed to learn from the fight and come again, falls to 17-2(7). Horn and Corcoran clashed heads on numerous occasions during the fight, and both men picked up cuts as a result. Corcoran, no big puncher, was aggressive early on, making things interesting for the bout’s first half – before Horn came on stronger and stronger. Horn’s big edge in punching power proved to be the difference today, while “The Hornet’s” speed and accuracy also proved to be too much for the brave but outgunned challenger. At the time of the stoppage, Horn was ahead 99-91 twice on two cards and by a shut-out of 100-90 on the other. Horn is now set to make a mandatory defence against pound-for-pound star, the unbeaten Terence Crawford. This fight, likely for Las Vegas, is penciled in for April. Horn won in dominating fashion today but his critics will no doubt say the WBO champ will have to raise his game if he’s to defeat the super-slick and stingily accurate Crawford – who will be having his 147 pound debut in April. Horn did struggle to make weight for today’s defence, but as he said himself, he got the job done in the end. Crawford will likely enter the ring with Horn as a pretty big betting favorite. Still, as we know, Horn is a man who is more than capable of upsetting the odds. Crawford is a thorough pro and he is unlikely to underestimate Horn the way many people suggest Pacquiao did. Previous boxing news: Has Vasyl Lomachenko got The 2017 Fighter of the Year Award all sewn up? Next boxing news: Stephen Tiffney vs. Lewis Paulin this Sat.